Yesterday was the first day that the general public was able to view the exhibition. The Conversations gallery was filled the entire day, and my First Look tour at 2pm was so full – maybe 60 people were on that one (I have a booming voice, so all could hear me, even if they couldn’t see me!) – that I offered a 3pm tour for those who wished to wait. That, too, was filled to capacity. The crowd was very diverse – young and old, African- Asian- and Euro-Americans, visitors from Richmond and further afield in Virginia, Mississippi, Kentucky, DC, Maryland, and points north and west. People enthusiastically applauded at the end of the tour. Many people came up to me and thanked our museum for creating such a beautiful, rich, and thought-provoking exhibition, and they expressed gratitude that the good Drs. Cosby so generously shared their collection with the general public so that the names and accomplishments of the artists who created such magnificent works of art are not lost to history (paraphrasing what I heard Dr. Bill say on more than one occasion). 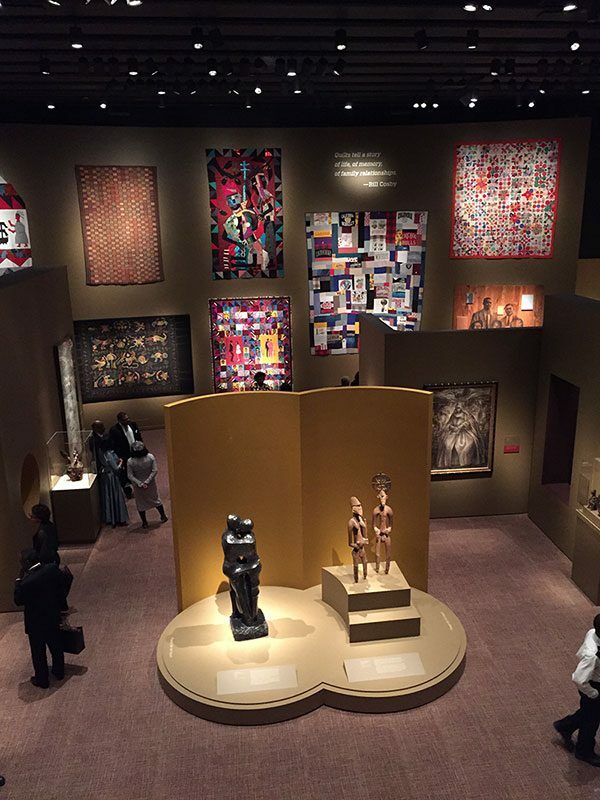 To a person, visitors were enthralled with the connections to history, heritage, knowledge, celebration and commemoration that are explored in the wall filled with African American quilts and African textiles. Visitors nodded and understood that in the Spiritualities theme, African and African American artists were creating works that engaged with spiritual subject matter but that these artists also rightly claimed that artists of color could and should insert themselves and their histories into Christian religious narratives, such as the Last Supper and the Crucifixion. In the Power and Politics section, visitors discussed with me how artists engage creatively in drawing our attention to the ongoing struggles for freedom and equality worldwide. What I saw in people’s faces as we toured through the exhibition was pride and understanding of the powerful messages that exceptional works of art can communicate when they are placed in respectful and inspired dialogue with each other and the capacity of great works of art to bring us together in an ongoing process of cross-cultural, intergenerational dialogue as we continue on this journey together as members of the human family. This is an exhibition that celebrates the enormous achievements of artists – African and African American – who are often overlooked in the history of art. This is an exhibition that brings people together and engages audiences in connecting with their own histories and identities. This is an exhibition that wakes people up to the power of human creativity, something that we so clearly value here at the Smithsonian National Museum of African Art.